Hungry? Tired of room service or the cafe at your hotel's lobby? Simply walk outside and taste the thousands and thousands of diners in Hong Kong. Diners that serves local Hong Kong cuisine usually open from 6am. You do have to know how to speak or read Chinese and adventurous in trying local food. Most diners that serves 'European' or 'International' food open after 11:30am and closes from 10pm to midnight. In order words, there are many of lunch and dinner choices in Hong Kong throughout the day. If you are not keen in the buffet breakfast at your hotel nor the Hong Kong style breakfast in local diners, try the world famous fast-food chain or coffee chain stores. They all open early, some even operates for 24 hours! Hong Kong is a shopping paradise as it offers a vast selection of international merchandise at reasonable price free of duties. Paradise does not open 24 hours a day. It would be useful to plan your trip around shopping hours to maximize your stay in Hong Kong. Having said that, it is pretty safe to say that most shops open from noon 12pm till 10pm. That's 10 hours of shopping per day and 70 hours per week! Some might open from 11am and some might begin to tidy up from 9pm. It would be fair to say that majority of shops do not open before 11am, unless they are grocery shops or supermarkets. If you need grocery, it would be smart to get them before 10pm, otherwise, you can look for convenient stores that opens 24 hours a day. Shops open at similar hours on Saturdays and Sundays. One of the common traps for tourist when they travel in Hong Kong is Zebra Crossings. Especially if you come from a first world country where drivers are polite and follow the rules, you will have different experiences when you put your feet on a zebra crossing in Hong Kong. There is only one thing to remember: Hong Kong drivers are supposed to stop at zebra crossings but 99.9% of drivers DO NOT. They will sound the horn, yell, abuse, give you the finger or (almost) run you over if you walk on a zebra crossing without looking! There is one thing to do: for your own safety, be a polite pedestrian and give-way to vehicles at zebra crossings. Once in a blue moon, you may find drivers who would stop for you. MTR, Mass Transit Railway, is one of Hong Kong's important public transport system. MTR is Hong Kong's subway; Hong Kong's underground. It is affordable, efficient and convenient. MTR gets you to most key tourist attractions. For places that are further away, MTR takes you to a nearby district and save time and money. One can find taxi stands, bus stations and/or mini bus stations next to all MTR stations. It was become Hong Kong's public transport backbone in the past 35 years. Taxi drivers in Hong Kong are genuinely professional. Vast majority of Taxi drivers are middle aged Chinese men who speaks very limited English. However, most of them know the English name of major streets, buildings and landmarks in Hong Kong. Taxi drivers who operates on the Hong Kong Island knows the island very well; those who operates in Kowloon knows the peninsular well. Taxi drivers are usually honest, reliable and would not go around in loops. They are required to display their license (Taxi Driver Identity Plate) with their photo and name at the front. They will present a receipt of the journey when being asked. Taxis in Hong Kong are very easy to identify. They all have silver roof and a light box that reads Taxi. The colour of the body of the vehicle distinguish which districts that taxi operates in. The most common taxis are in red. Red taxis operate in most of the metropolitan district of Hong Kong. Tourists are most likely to hop on a red taxi. Green taxis operate in New Territories, which is the northern rural parts and new towns of Hong Kong. Blue taxis operate on Lantau Island. There are straight rules on where may which taxi operates under which condition. All taxis in Hong Kong must charge by the meter. The charges are clear listed on all passenger doors in English and Chinese. 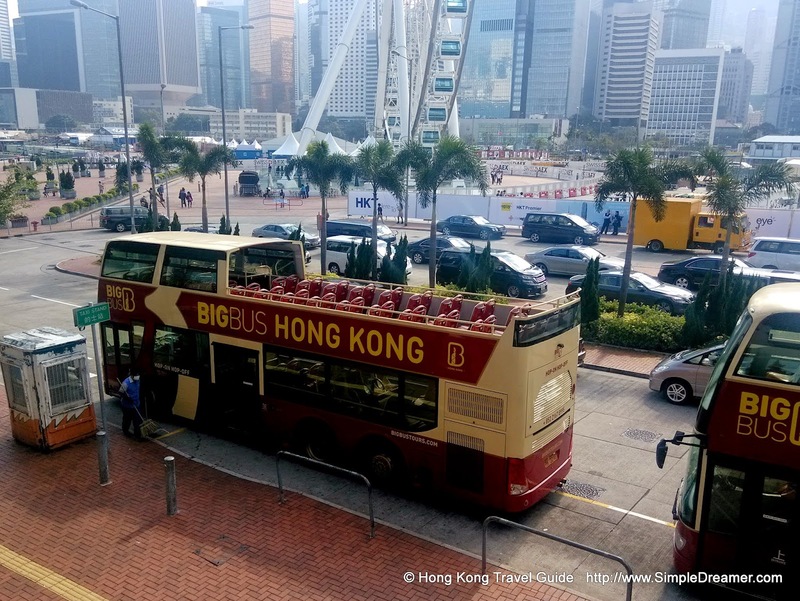 Just like any other city that welcomes tourists, Hong Kong has Hop On Hop Off Bus service. They are easy to identify and information are widely available. While they are a great way to explore Hong Kong, considering the tininess of metropolitan Hong Kong and considering English is one of Hong Kong's official language, there are some budget alternatives that offers the same magic. All you need is an Octopus Card (or cash) to travel on the various Hong Kong Public Transport. Public Bus is one of the cheapest way to see neon signs on Kowloon's famous Nathan Road. Take the Star Ferry if you wish to see the Victoria Harbour. Hop on a Tram to see the Hong Kong Island in slow motion. Take the MTR if you wish to return to your hotel on time. Tramways or simply Tram is a public transport system that offers an unique Hong Kong flavour. Tram runs on dedicated tracks and share some parts the road with other vehicles. Tramways stretch across the northern side of the Hong Kong Island from Kennedy Town to Shau Kei Wan, running East bound and West bound. (Note: The Happy Valley section is a loop that detours from the main tracks.) The full journey would take more than 2 hours, mostly due to the fact that trams are extremely slow. There are plenty of stops in between. No matter where you hop on, it charges a flat rate of just over two HK dollars. It is a great way to see Hong Kong if you have time to spare. The Star Ferry carries passengers across the world famous Victoria Harbour between the Kowloon peninsula and Hong Kong Island. It offers an unique cross-harbour experience at a reasonable price. There were four Star Ferry piers but they are either shifting or slowly disappearing. The Tsim Sha Tsui and Central piers offer the most frequent ferry services. There are different types of services that Star Ferry offers: the public transport service that is available for everybody (including tourists) at a very cheap price; and the Victory Harbour 'tour' service that is comparatively much much much more expensive. The very nature of the two services are very different: the former takes you from point A to B, where the latter is a sight seeing tour. We recommend the budget option as is offers enough taste at a very reasonable price. If you need more, simply take the ferry across the harbour multiple times! Ten HK Dollars offers 4 journey on the Star Ferry, where usually 1 ride would be sufficient for most. The Peak is one of the must go places in Hong Kong. On a good day, you can see stunning metropolitan Hong Kong from the Peak. There are multiple ways to approach the peak: by walk, bus, taxi or by the Peak Tram. The Peak Tram itself is a tourist attraction and it is a bit pricy. However, it is worthwhile. Travelling on the Peak Tram is a unique experience that offers plenty of photo opportunities. You will admire how the engineers built this cable car service a century ago. The most difficult part of the journey is to find the station itself! You need to look for the "Garden Road Peak Tram Lower Terminus", which is somewhere between Central, Admiralty and mid-levels. The best way to go there is by foot. While it may look easy on the map, it is not easy to find. We recommend two routes. The first one is to start from Central and walk up Garden Road and aim for United States of America Consulate, which is opposite to the Peak Tram Terminus. The second approach is starts from Admiralty MTR station and walk through Hong Kong Park. Both routes from Central and Admiralty is an uphill that takes around 15 to 20 minutes, if you can find the terminus that is. The simple alternative is to get a taxi, tho, it would take the fun of exploring away. Buses have been supporting Hong Kong in the past 80 years. Although it is still a relatively budget way to travel around Hong Kong, buses are slowly being taken over by Hong Kong's railway system MTR. Having said that, these double-decker monsters can easily be found throughout Hong Kong. Vast majority of public buses in Hong Kong are air-conditioned, pumping cool air during both summer and winter. Buses in Hong Kong are operated by two companies, with the exception that bus service on Lantau Island is run by another company. No matter where you are in Hong Kong, bus schedules are difficult to predict. Do expect to wait for up to 20 minutes for a bus. While this may seem short in some cities, 20 minutes is a lot of time in a fast-paced city like Hong Kong. Having said that, buses take you to plenty of districts in Hong Kong that railway does not cover. Simply pay for your bus journey with coins (exact amount required, no change will be given) or with an Octopus Card. Today is SimpleDreamer.com Hong Kong Travel Blog's 4th Birthday! Four years ago, we started this website with nothing but passion. Today, we are a Travel Blog with over 350 posts serving over 170,000 visitors. It has been a fun journey. We will continue this journey by sharing more travel photos, videos, blogs & tips covering Hong Kong and Beyond! Happy Birthday, Hong Kong Travel Blog @ SimpleDreamer.com! Mini Bus (Public Light Bus) is the in between alternative means of transport in Hong Kong. They are much small than buses but bigger than taxis. Mini Bus usually fill the gap by serving in routes that buses or MTR do not cover, offering a cheap alternative to taxis. These 16 seats monsters can be found in Red or Green, which can be easily distinguished by the colour of the hood. Green mini vans run in fixed routes. In other words, green mini vans have a fixed starting and ending destination and a fixed route. They must follow the mini van bus stops along the way. Payment is done when you get on the green mini vans. Nowadays, it is common for green mini van to accept octopus payment. Unless you REALLY know where you are going, or know the area of your destination very well, tourist are recommended plan and consider carefully before hopping on green mini vans. Chinese and English are official languages in Hong Kong. Almost 90% of Hong Kong's population speaks Cantonese. There are no official statistics on how many in Hong Kong can speak or understand English. However, it would be fair to say that 1 in 2 people you run into has some command of English. Of course, it depends on which districts you visit and what's the context of your conversation. Vast majority of written signs in Hong Kong has both Chinese and English. Public transport system announce in Cantonese, English and Mandarin. One can navigate to most parts of Hong Kong with a basic understanding of simple written and verbal English. Plastic Bag costs 50 cents each in Hong Kong. The Hong Kong Government introduced this 'plastic bag levy' (Environmental Levy) to discourage the use of plastic bag. All retailers fall under this scheme and bills their consumers for every single plastic bag. There are certain types of shops that are exempt from the scheme. There are also many product suppliers thought for their end consumer and packaged their products with a plastic bag that is exempt form the scheme. Although, it is only 50 cents, cashiers would usally ask for confirmation before they bill you for a chargeable plastic bag. While you are out-and-about and your phone is about to go flat, free battery charging service would go a long way. Simply walk into any shopping mall in Hong Kong and ask for it! Key shopping malls in Hong Kong offer this service for free. Some has self-serve mobile phone charging counters, some loans portable charger (with a refundable deposit) at concierge. Mobile data charges are usually more expensive, however, data day-pass can be purchased. The better alternative is to search for free wifi hotspots around you. A Hong Kong prepaid SIM card would work with most common GSMA mobile phones, given that it is not SIM locked. Please contact your local mobile operators to check whether your phone is SIM-locked. Hong Kong IS duty free. A vast majority of goods and services in Hong Kong is free of any form of government tax or duty. Even beer and table wine are duty free in Hong Kong! Useless you are purchasing tobacco or spirits, real estate or registering a vehicle, most goods are services do not incur tax or duties. This is particularly true for most consumable goods and luxury items, making Hong Kong a popular shopping paradise for electronics, watches, luxury handbag and cosmetic. Beware of all shops that declare 'dutyfree' with colourful neon signs in Mong Kok and Tsim Sha Tsui area. They may sweet talk you into over priced items in return of 'dutyfree'. Hong Kong Dollar is Hong Kong's only currency. USD $1 approximately equals to HKD $7.8; where EUR $1 is around HKD $10 to $11. Vast majority of shops in Hong Kong accepts payment in HKD only, some may accept the mainland Chinese currency Renminbi RMB or CNY. Although major credit cards are accepted in more stores, cash is still the preferred means of payment in many locations. In particular, local diners, shops, bargain markets and public transport such as taxis usually deal in cash. It pays to exchange some Hong Kong Dollar at the airport. There are also plenty of currency exchange locations in most tourist areas. HKD is at a fixed exchange rate to USD. The monetary authority keep the rate of USD $1 within the HKD $7.75 to 7.85 margin. This made it very easy for visitors to determine whether the Buy & Sell of a currency exchange counter is favourable. Octopus is a common electronic payment system in Hong Kong. An Octopus card is at a standard credit card size. Electronic payment is made by waving this proximity card (i.e. RFID) at an Octopus terminal. Octopus payment is accepted in most transportation and major retail stores, making it simple and easy to pay for travel, food and common merchandise. Tourists are recommended to get an Octopus Card upon arrival. Any person may loan an Octopus Card with a HKD $50 refundable deposit. In theory, one may 'own' the card for any period of time. There are different versions of Octopus in all sizes and shapes, some are available for purchase (i.e. non-refundable). Before you can pay with an Octopus Card, you must charge (load or reload) the card with cash. This can be done at all MTR stations, most convenient stores, supermarkets, chained coffee and fast-food stores. Automatic reloading is available to those who own a Hong Kong credit card and is recommend to those who wish to stay in Hong Kong for an extended period. Hong Kong International Airport is the only commercial airport in Hong Kong. Located at Chek Lap Kok on Lantau Island, on average, it take around 45 minutes to commute to major CBDs. The quickest transportation means is Airport Express, a high speed train service from the airport. Taxis and buses are also available, of which the former attracts a high fee and the latter prompts a longer journey. Hong Kong International Airport is one of the world's busiest yet most efficient airport. The majority of passengers would be able to complete immigration, baggage claim, and customs check within 30 to 45 minutes upon arrival. Departing passengers are still recommended to spare 2 to 3 hours at the airport, where there are plenty of dining, shopping and entertainment choices.